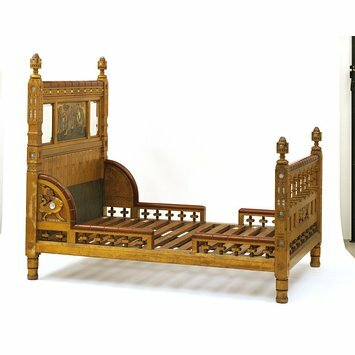 William Burges (1827-1881) designed this bed for the Guest Chamber of his own home, the Tower House in Melbury Road in Kensington, London. He designed every aspect of the house himself. The exterior is in the Reformed Gothic style. The interior is in Burges’s own distinctive richly ornamental style, which was influenced by medieval art. Medieval prototypes provided the inspiration for the colourful painted decoration that adorned much of his furniture. The theme for the Guest Chamber was ‘Vita Nova’ (New Life). The flower and animal motifs suggest a garden full of new life. The entire bed is gilded and richly ornamented with carvings, mirrors, painting, fragments of illuminated manuscripts under glass and rock crystal. Burges designed the other furniture in the room to match. He derived the ornament for the bed from medieval furniture. On loan to National Trust Knightshayes Court. 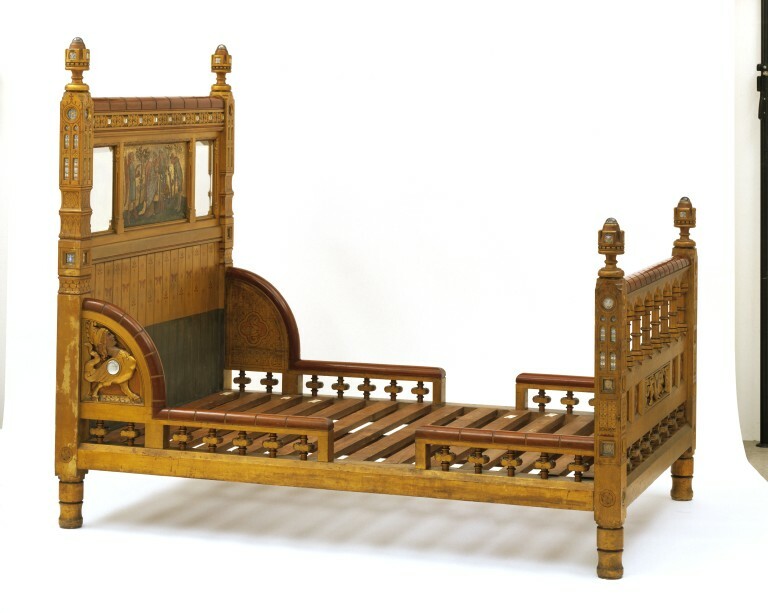 A large rectangular wooden bedstead, entirely gilded and painted, except for the top rail of the bed-head, foot board and side boards, which are of polished hardwood. The side brackets are made of mahogany, as are some, perhaps all, of the turned elements. The bed posts and tongue and groove panelling in the headboard are pine. The oil gilding is coated with a translucent yellow glaze, and over this are stencilled and painted decoration of butterflies, flowers, stars, and repeating ornament. The bed-head is inset with two large bevelled mirrors either side of a painting of the 'Judgement of Paris' in medieval style, by Henry Holliday, R.A. The bed posts are inset with painted vellum or paper and textile fragments under glass, within gothic-shaped recesses. The foot of the bed is inscribed 'Vita Nova', and on the back of the head-board, 'William Burges me fieri fecit' and 'Anno Domini MDCCCLXXIX'. The foot of the bed has quatrefoil piercings and rows of turned balusters. In the centre is a carved relief of a shield with a heart, and two hares on either side. The side brackets at the head end of the bed are carved with grotesque figures, one female, the other male. The sides of the bed have short turned balusters supporting a rail. The head and foot posts have turned finials surmounted with rock crystal half orbs. Several entries in Burges's Ms Estimate Book (National Art Library 86.SS.52) refer to furniture made for the Golden Bedroom at Tower House by a carpenter, John Walden, of Maiden Lane, Covent Garden. On March 12, 1879, the Book records 'Bedstead in deal, carved panels mahogany all carving except Nicholls', made by Walden at a cost of £39 13s. On June 25 1879 the Estimate Book records 'Carving to Bedstead Guests room Nicholls 15/15/0', presumably the carver, Thomas Nicholls. Set into the headboard was a painted panel, The Judgement of Paris, by Fred Weekes. This had originally formed part of a glazed panel in Burges's rooms in Buckingham Street. The bed and the washstand (W.4-1953) were both lent to the Exhibition of Victorian and Edwardian Decorative Arts held at the V&A 1952-3. Correspondence in the exhibition file indicates that Oliver Poole was originally asked to lend the bed but he subsequently requested that Col. T.H. Minshall D.S.O. be acknowledged as the owner. When approached about giving both the bed and washstand to the Museum, Mr Poole confirmed that he and his mother, Mrs.Minshall, would be happy to present both. He subsequently requested that the bed (and presumably the washstand) be recorded as given by Col. T.H. Minshall, D.S.O. ‘Charles and Lavinia Handley-Read at Home’ by Charlotte Gere, in ‘The Charles and Lavinia Handley-Read Collection’, Decorative Arts Society Journal no. 40 2016. The head inset with two large and ten small mirrors and a painting of a mediaeval version of the Judgement of Paris. Each side-board and post set with illuminated vellum and textile fragments under glass. Inscribed 'VITA NOVA', at the foot of the bed and on the bed posts 'WILLIAM BURGES ME FIERI FECIT' (right) and 'ANNO DOMINI MDCCCLXXIX' (left). Designed by William Burges in 1879 for the Guest Chamber, Tower House, Melbury Road, London. W14.